Which All Inclusive Hotel for you? Okay, so you've decided on an All Inclusive holiday to Bulgaria but with so much choice you are not sure which hotel is right for you. Well as the specialist tour operator to Bulgaria let us take you through what we consider to be the most important decisions you will need to make when choosing your All Inclusive holiday. All Inclusive holidays are a popular choice for many reasons, mainly because you don't need to worry about your meals, entertainment, facilities at the swimming pool etc as they are usually always included in your package. When choosing your All Inclusive holiday the first thing to consider is what type of trip it is you are going on? Is it your honeymoon, a relaxing trip with your partner or are you intending to let your hair down with a group of friends? Perhaps you are looking for a family friendly summer getaway? Depending on your type of holiday, Bulgaria offers many different kinds of hotels that offer All Inclusive Packages to ensure you find the perfect All Inclusive holiday for you. If you are going away for a romantic break or your honeymoon then its all about relaxation and intimacy so we recommend you make sure your chosen hotel and the rooms that are available are best suited for these needs. Will you be wanting a luxury room? a sea view perhaps? You may also want to consider which hotel chain manages the hotel as some hotels are recognised for their facilities which are specifically designed for romantic couples & honeymooners. These could be anything from relaxing spa facilities to a cosy, candle lit restaurant. An example of such a hotel could be the 5* Hotel Marina Royal Palace in Duni which has everything needed for a dreamy holiday to Bulgaria. The resort of Duni is a lovely purpose built seaside resort which offers an abundance of facilities and provides a relaxed atmosphere, ideally situated in a secluded and picturesque location Duni offers one of the longest beaches in Bulgaria. The resort's 3km long sandy beach is as impressive as the accommodations that surrounds it. At the north end of Duni, a breakwater running parallel to the beach provides an area of calm shallow water ideal for water sports. When it comes to family holidays, you should make sure the hotel you choose is equipped with everything you may need during your stay like a baby cot, swimming pool for kids, first aid facilities & a kids club. This will ensure you enjoy your time together as a family and as parents without having to worry about your kids. As parents know, kids can be very fussy eaters so a holiday to Bulgaria should be a breeze as most hotels offer buffet style meals with plenty of choice available, ensuring that even the little ones will find something they like! 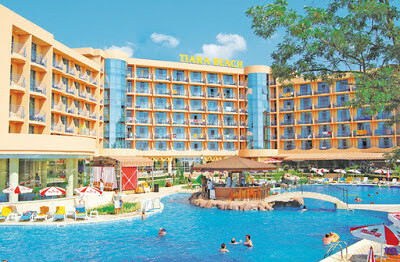 A popular family hotel is the 4* Tiara Beach in Sunny Beach which families enjoy returning to year after year. If you are taking a holiday with your friends then its all about the perfect beaches, fun and parties! We recommend finding a hotel that either has its own night club or a night club nearby so that you will not have to leave the resort or walk long distances to have a great night out. If you and your friends are adrenaline-seekers then take a look at the resort facilities to see what activities are available for you and your friends. 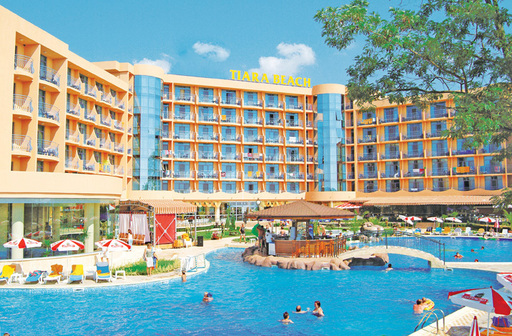 If you are wanting All Inclusive then the 3* Hotel Pomorie in Sunny Beach is recommended for groups of friends or if you are wanting to travel on a budget and just need a bed to sleep in, take a look at our specially selected “young & lively” hotels. As the biggest and most popular of the Bulgarian Black Sea Resorts, Sunny Beach stretches around the 8 kilometer-long Black Sea shoreline, comprising of a string of beachfront hotels and complexes linked by the buzzing promenade of shops, stalls, restaurants and bars where you can enjoy food and drinks at unbeatable prices. On the beach you will find a variety of sports including paragliding, volleyball and jet-skiing, just a few examples of why Sunny Beach Holidays are so popular with Balkan Holidays clients. As the sun goes down, Sunny Beach comes alive with its nightclubs, bars, live music and traditional floor-shows. All hotels presented by Balkan Holidays are available to view on the website with a full description & map of where the hotel is located in resort to help make your decision and ensure you select the best All Inclusive hotel possible for your chosen holiday. With over 60 All Inclusive Hotels in Bulgaria with different types of all inclusive to choose from, booking your All Inclusive Holiday with Balkan Holidays has never been easier. To find out more to book click here.